Overview of Qian Hai South Shore and Entrance. Relax at the Park Entrance with or without a Neck Massage or walk on to Lotus Lane, in summer a sparkling Cafe' & Bar Alley with overview of Pleasant Qian Hai. Currently Qianhai is noted not only for it's cooling waters in Summer but recently also mainly for it's "Lotus Lane" (TianHe Fang). After sweeping changes, which among things introduced the western bar-fenomenon to the Shichahai Area, Qianhai opened it's Lotus Lane in October 2003. The romantic and dreamy sounding Lotus Lane is a short but lively strip of modern and luxury bar-restaurants strung along the West Bank of Qianhai Lane. Famously noted by visitors, the lane begins unspectacularly with a starbucks coffee joint, mostly appreciated by daytime tourists but the other venues are of higher value. 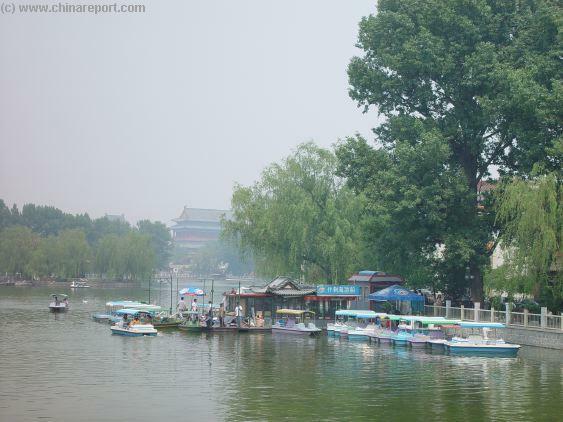 View of Lotus Lane, Qian Hai and boats playing. 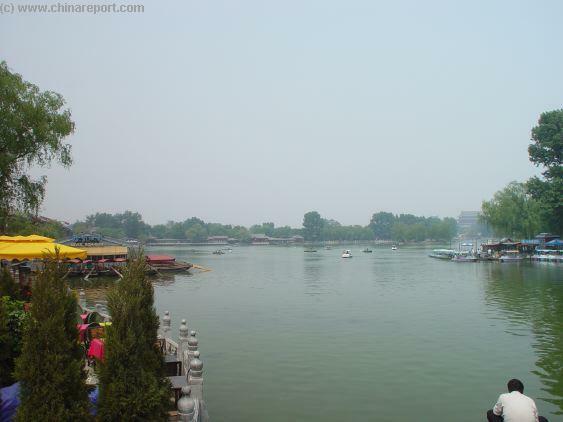 Qianhai Lake and ShiShaHai Area - More Bars and Nightlife can be found by ways of a walk along the East-Bank to Jin Ding Bridge and Houhai. Several establishments are located along the eastern bank. 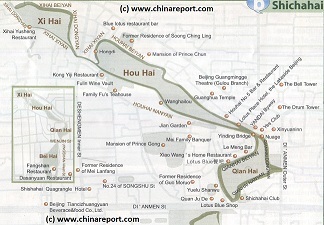 By now Houhai offers and equal variety of Bars, Dancings and Bar-Restaurants to explore. They even have lower prices. Go visit and find out more for yourself. 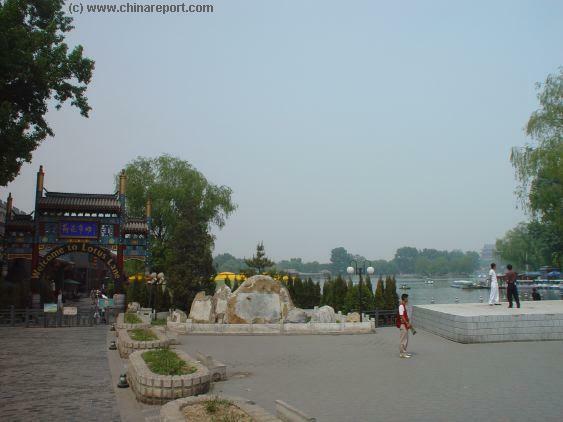 On the North Shore of Qianhai Lake, at some distance, the Drum Tower and Bell Tower are always visible. To the South across DianMen Nadajie (Ping An Avenue) lies Beihai Park, which can be entered through it's North Gate. 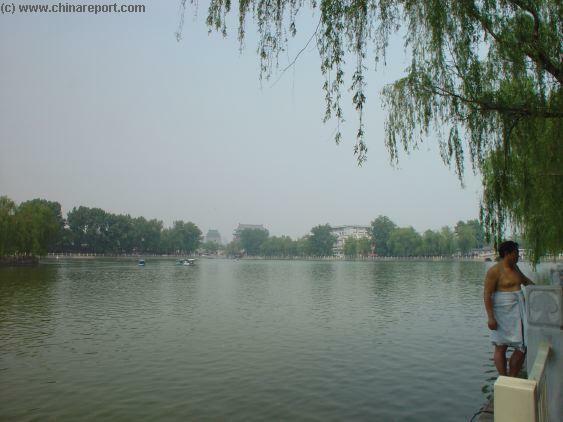 For More information and backgrounds on the Back Lakes - ShiChahai Area of Beijing, please click through to our Pages on Jin Ding Qiao - the Ancient Gold Ingot Bridge. The rest of the Lotus Lane strip is filled with restaurant-bars, the odd tea-house and some true nightlife in the shape of the Alpha Omega Club, located at Number 9 Lotus Lane. This spacious 11.000 square meter bar consisting of three floors divided into 4 main theme area's is currently considered to be one of the hottest in town. Nightlife goes on here untill early morning and the crowd consists of a variety of nightcrawling internationals and local Beijingers depending on floors. The Alpha Omega Club offers it's own brand of Beer, fresh pizza from the house, luxury sigars, great wines and a variety of western foods. It's floors are divided into the restaurant and bar, the Jazz Club on the 2nd floor and dancing with modern music and DJ's in the basement. 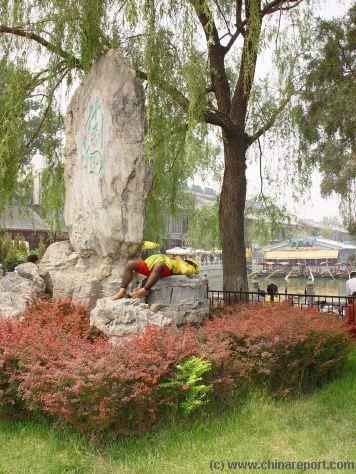 For long years since the demise of the Qing Dynasty in 1911, Qianhai has been offering cooling waters in summer and a variety of culture and entertainment along it's banks. Especially in Summer, both Qianhai and Houhai were welcome retreat's from the Summer Heat, drawing large crowds to their banks. The area soon became a popular city retreat for poets, writers and other artistic wonders. 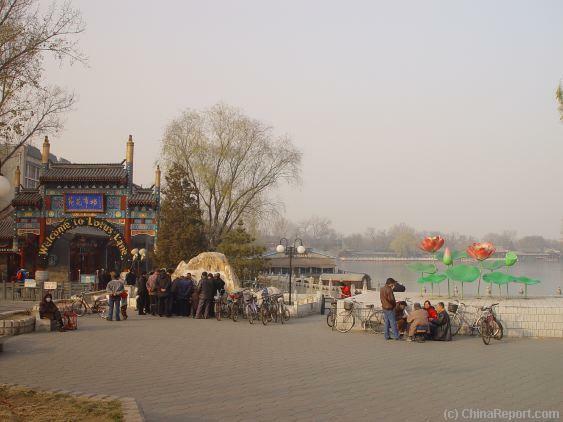 After China's Revolution and the establishment of the Peoples Republic of China at the end of 1949 AD, the area has been officially open to the Beijing Public and has eversince been an very popular and romantic recreation area. More recently it offered boatrides for lovers and tourists, to float away and enjoy the day. Many locals even go for a swim in Qianhai regularly, however, this is not really advisable. In winter it turns into one of the convenient skating rings inside the Inner City. A quiet Lotus Lane in wintertime. Men & Women in white offer a variety of massages to be enjoyed. Along the West Bank a small strip of up-scale, high-end Restaurants & Tea-Houses with great terraces for a cooling afternoon drink. 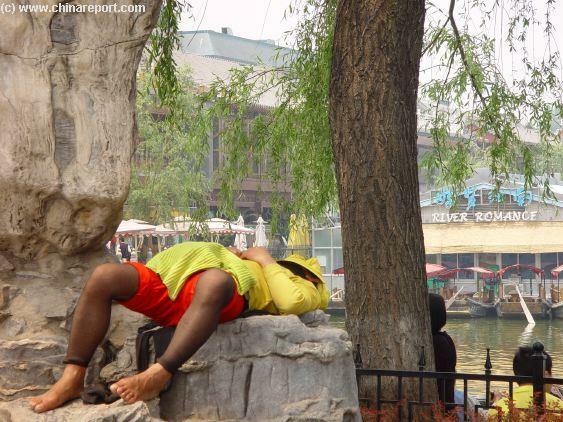 A colorful local Bum enjoying a romantic sleep under a shady tree at Qianhai Lake in Beijing. The Most Famous and Most Popular Restaurant of Lotus Lane is the Yunnan styled Chama Chudao, meaning "Southern Silk Road". The original South Silk Road Restaurant is located elsewhere in the City of Beijing, however the Qian Hai restaurant is nearly equally popular. Try out savory southern styled meat dishes and head for Chama Chudao ! View along the western bank of Qianhai showing Lotus Lane and it's Pavilions. This is the southern end of what is known as the ShiShaHai Area. At Jinding Bridge either follow the Traditional Street to end up just South of the Drum-Tower. 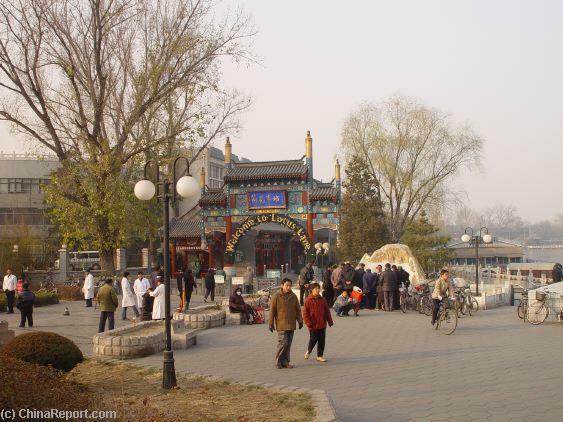 Or, Go Up from Jinding Bridge along the banks of Houhai to first the Guangha Temple, then the Minstry of Public Health and on along the banks to find Soong Ching-Ling's Former Residence, now a Museum near the North-End. Most Bars and Cafe's are located near and around Jin Ding Bridge. 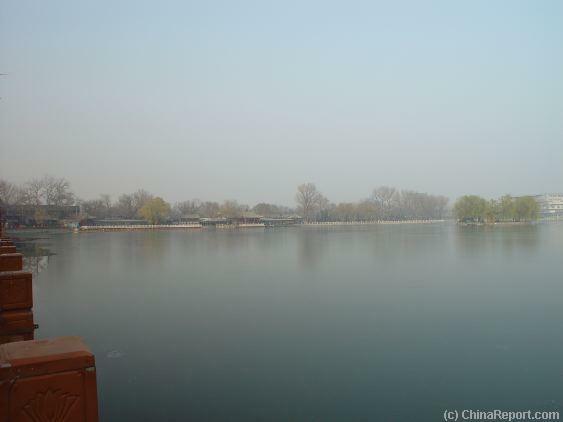 Go across the bridge and follow the XiCheng Side of the Houhai Lake and find the Palace of Prince Gong (Gong WangFu) hidden away near the North End of the Banks. 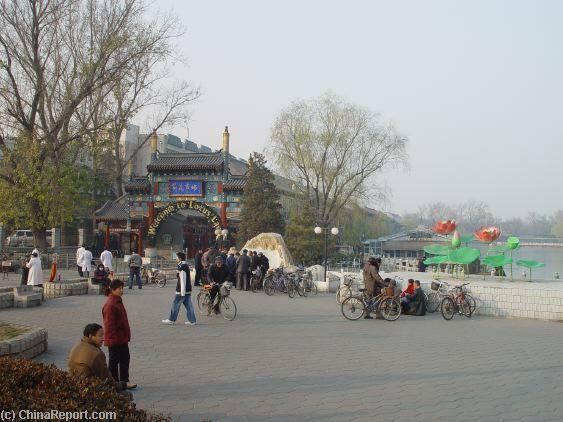 The back lakes area, particularly the Houhai Area have always been part of upscale living in Beijing. The Prince Gong Palace was the home where little Pu Yi, later China's last Emperor, was born. 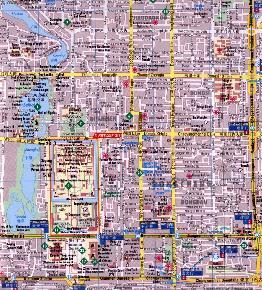 Other Former Imperial Mansions dot the Area. of the Belgian Cartoon Hero "TinTin (Kuifje)". It's not a cartoon or bookstore but a restaurant and bar. In fact, the first floor of the Blue Lotus features the largest Bar in Lotus Lane (so far). It's second Floor is a more comfortable one with a grandiose view of Qianhai and the view of the Bell- & Drum-Towers in the North. The Lotus Blue Kitchen can best be described as Fusion-Thai. 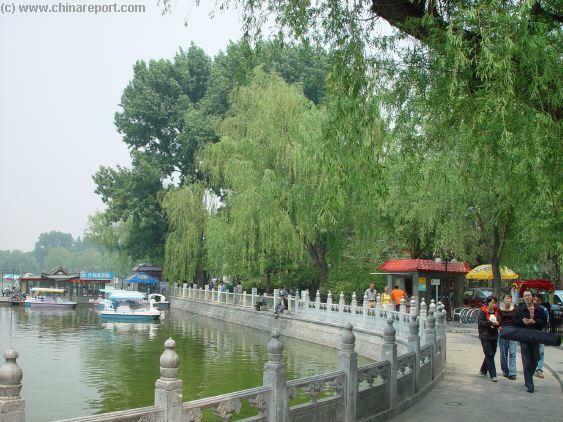 The Three Lakes - Qianhai and Houhai are part of the ancient cities water-supply-route. 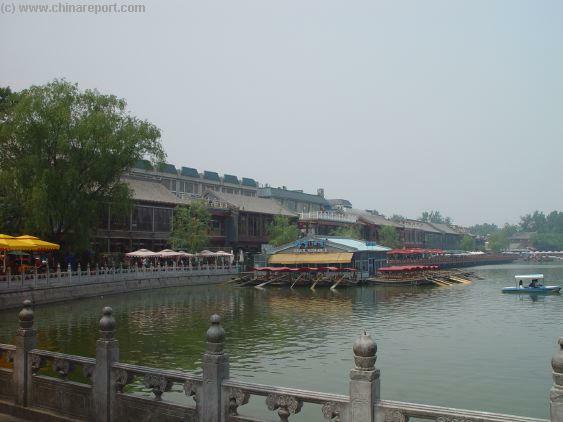 Originally dug-out during the 14Th Century and the short-lived Yuan Dynasty, the lakes were expanded later by the Ming Dynasty, to function as harbors for the many barges traveling to- and from- Beijing on the economically vital Grand Canal, constructed and completed under the prosperous Ming Rule. 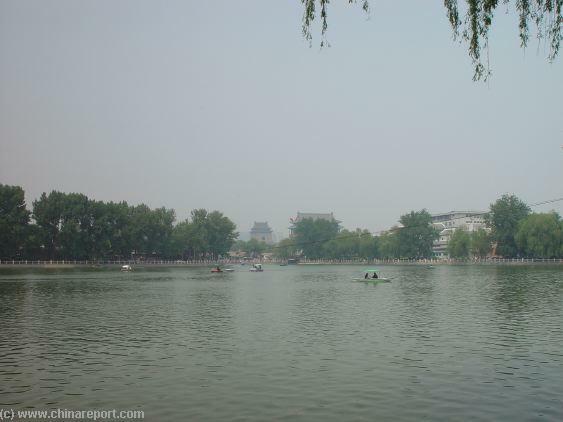 Water flows down from the Western Mountains into Kunming Lake of the Summer Palace Park. From here it continues past Beijing Zoo and through the City Moat to end up in the North at Houhai. From Houhai the water slowly flows underneath Jin Ding Bridge to pass through Qianhai on it's way to BeiHai from which it eventually reaches The Palace Museum. Along it's eastern banks an interesting marble balustrade walking path, reminiscent of the Imperial Palace Architecture, takes one past one of Beijing's oldest remaining historical bridges. From there it is on to JinDing Qiao, the Silver Ingot Bridge. From there it is just a short walk to a number of interesting locations. Rockery at the South Entrance to Qianhai Lake, Lotus Lane and the Promenade. 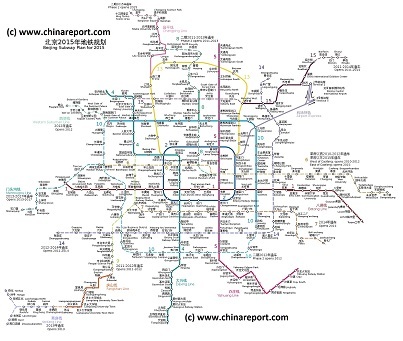 AsiaReport.com generated Google Map Overview of the Qianhai Lake on the border of Xicheng- and Dongcheng Districts of Beijing.